As we enter the final week of the regular season, St. John's still looks like the class of Central Mass, but they got everything they could handle from Algonquin last Saturday. The Pioneers needed a Patch Ryan overtime goal to best the rival Tomahawks in a game that proved St. John's could win the close one, and that Algonquin won't be relinquishing it's CMass crown without a fight. Northbridge makes it first appearance on our radar after a 3-2 slugfest win over BVT in the Boston One Fund double-header at Grafton High School last Friday. The night also saw the host Indians knock off upstart Westboro, and set up the most anticipated game in the region today when Grafton visits St. John's. Since a disappointing loss to Shrewsbury in mid-April, the Indians have rolled off 11 consecutive victories, including a statement win over reigning Central Mass champion Algonquin, a blowout of up-and-coming Nipmuc and an impressive 10-9 victory at Amherst-Pelham. St. John's, meanwhile, has played as brutal a schedule as anybody in Central Mass, and they don't have a bad loss on their resume. That close win over Algonquin had to be huge for the Pioneers' psyche after being eliminated by the T-Hawks the last two years, and a win over Xaverian Bros. proved they can beat anybody when they're on. Even a close loss to heavy Western Mass favorite Longmeadow was something to build off for the Pioneers, but today's game against Grafton will essentially name a favorite for the district playoffs. Look for a shootout between the dynamic duo of Tyler Reilly and Bryan Rotatori from Grafton and the St. John's attack trio of Drew Smiley, Josh Freilich and Hunter Burdick. The T-Hawks have already clinched the league but have been playing better of late, and they don't want to lose any momentum against a dangerous Westboro team. On the other side of the field, the Rangers badly want a signature win to hang their hat on come tournament time. With a tough combination of solid defense, a hot goalie in Dan Terry, and a fantastic face off guy/ground ball scooper in Tom Lawton, Westboro will be a tough out for anybody. But, the Rangers need to bounce back after giving up 17 goals to high-powered Grafton, and Anthony Cibelli and the Westboro attack need to find their form from two weeks ago after scoring only six goals against Cohasset. When you play for a team that has Navy commitment Drew Smiley and CMass goal leader Josh Freilich on attack, it's easy to get lost in the shuffle. 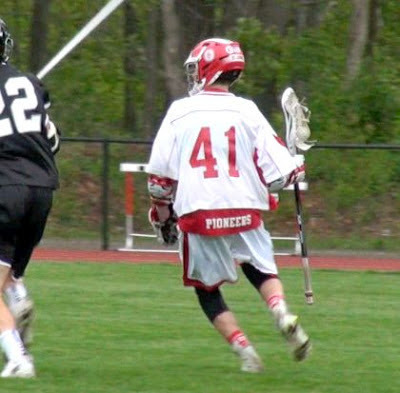 But Hunter Burdick has probably been the region's best attackman the past week or so, scoring a pair of goals and looking incredibly active in the Pioneers' 10-8 loss to Longmeadow. He then followed that game up with an even more impressive performance, notching a hat trick to help St. John's outlast Algonquin, and snap a four-game losing streak to the Tomahawks. The Pioneers will need Burdick to continue his stellar play if they are to win Central Mass, and perhaps more, come tournament time.